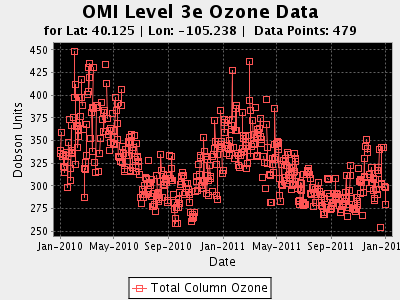 This tool allows OMI or OPMS daily ozone values to be retrieved as a time series for a specific latitude and longitude coordinate and date range. The resulting dataset can be generated in either CSV-text or an XY-Plot in PNG format. For text-based datasets, missing data values can be filtered from the text dataset by setting Include Missing Data to NO. The ozone values returned include the value from the nearest satellite lat/lon data point, and an interpolated value. OMI data are gridded at 0.25 degrees, OMPS data are gridded at 1.0 degrees. Data are rendered in a new browser window or tab (browser setting specific). OMI Satellite Level 3e daily averaged ozone data gridded at 0.25 x 0.25 degrees are being obtained from the NASA Goddard Earth Sciences Data and Information Servies Center Website. Availability of the OMI FTP data cover October of 2004 to present, and have about two days latency. OMPS Satellite daily averaged ozone data gridded at 1.0 x 1.0 degrees have been obtained from the NASA Goddard Space Flight Center Website. Availability of the OMPS FTP data cover Jan 26, 2012 to present, and have about six days latency. Header Information summerizes the user's supplied parameters, and the total count of data points in the returned dataset. Shows the values used in the interpolation process. See below for more info about how the ozone interpolated values are calculated. Image Size: Height and Width in Pixels. Satellite data are read from files into indexed Vectors for latitude, longitude, and O3 values. The index of the closest lat/lon is determined by comparing the sum of the difference of absolute values of tagetLat-SatLat and targetLon-SatLon. Once the index is known then the values are extracted from the Vectors. The Figure below illustrates the closest point algorithm. 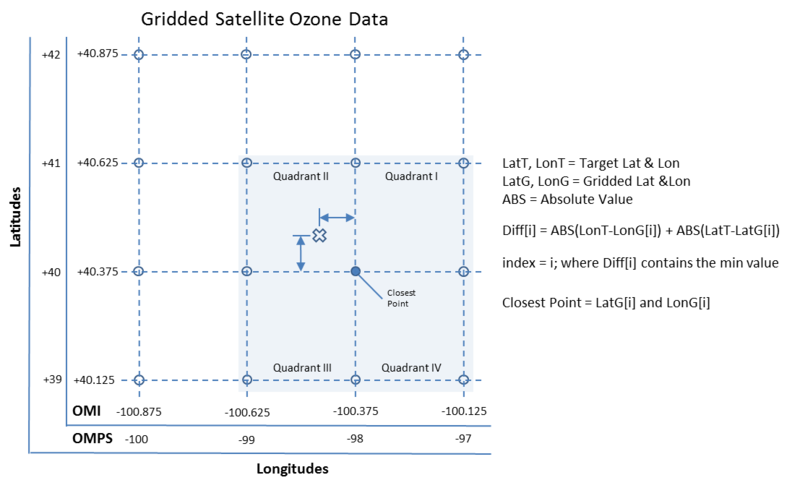 Interpolated values of ozone at the target lat/lon are calculated with a Bi-linear Interpolation algorithm that first determines what quadrant the target lat/lon fall with reference to the closest point, then applies the interpolation to the four ozone values of the quadrant (q11, q21, q12, q22) as shown in the Figure below.